Updated: May 7, 2017, 12:30 a.m.
Hall County’s efforts to provide more creative and challenging education for all students started with a lunch meeting more than a decade ago. Dr. Sally Krisel, now director of innovative and advanced programs for Hall County Schools, was the director of gifted education for the Georgia Department of Education when she agreed to meet Hall superintendent Will Schofield for lunch in 2006. “He said, ‘Sally, I’ve just become convinced that we will never have the schools that we want for our children if we cannot get over our obsession with adequacy,’” she recalled. She said Schofield then offered her a job, asking her to bring her experience in gifted education to help challenge all students in the district toward greater achievement. While part of the effort is designed to offer greater challenges to students labeled as “gifted,” Krisel said many of the additional programs and schools have included students who are not labeled in that category. “We’re seeing achievement go up; our dropout rate has reduced dramatically,” she said. “I think we have happier kids and happier teachers. 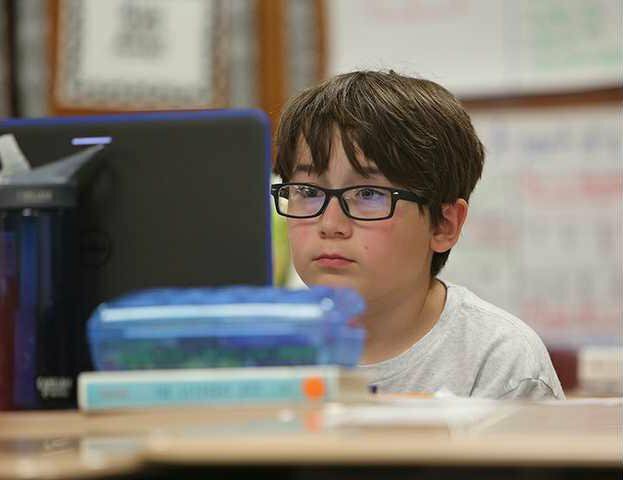 The Georgia Association for Gifted Children recently selected Hall County as the winner of the Margaret Bynum Award, named for the first director of gifted education in Georgia. The award recognizes outstanding contribution to gifted education in the state. In addition, Krisel said the programs have attracted visits from educators inside and outside of Georgia. Krisel said district officials began looking at the needs gifted education address, such as letting students pursue interests in depth, emphasizing creative productivity, independent learning, group work and presentations, communication skills as well as creative and critical thinking. “They’re important for all kids and they are enjoyable,” she said. Boring is not a word that you will hear in Riverbend Elementary School’s Advanced Scholars Academy. There is an ASA class for every grade where the students are involved in project-based learning. Students in the kindergarten class recently made unicorns, ponies, castles, a “big rig,” a lawn mower and other things out of boxes. A fifth-grade class studying World War II was working last week on a project they will present at a showcase focused on the bombing of Pearl Harbor. In addition to the showcase event, students also participate in conferences where they explain what they are learning to their own parents. Heather York, a fourth-grade teacher in the program, said the classes are challenging to teachers as well as the students. Principal Donna Wiggins said many of the ASA students are not labeled as gifted. She added that the program has led teachers in traditional classrooms at the school to try some of the ASA approaches. The school district even received a waiver allowing part-time enrollment for some home-school students. Jordan Beasley, whose son, Nate, has been in the program for the past three years, said the program allows her to emphasize some things at home while giving Nate time with other kids at school. Emily Bagwell, another parent sending her home-school child, Allison Bailey to Riverbend part-time, said the staff has been flexible working with a part-time student. Da Vinci Academy runs a museum based on what students are learning. It has about 1,500 visitors a year. Students are chosen based not on whether they are labeled gifted, but based on passion for arts, technology or science. Honors Mentorship puts more than 600 high school juniors and seniors with mentors in the field they want to study. The students are required to make a presentation on their experience. More than 240 International Baccalaureate diplomas have been awarded in Hall County through an intense program that often produces high school graduates entering college as sophomores. With the exception of the International Baccalaureate program, Krisel said these and the more than 20 other innovative programs and schools are original ideas, many coming from classroom teachers. She said about 600 teachers have earned their gifted education certification even though not all teach in gifted programs. Looking back, Krisel said she is glad she agreed to meet Schofield for lunch on that day in 2006.